Click or pinch to zoom on mobile. “We have built, we have progressed. But no other hallmark of success will be more distinctive than that of achieving our position as the cleanest and greenest city in South Asia,” he said in 1968.In addition to adverts, there were public education activities, lectures by health officials and spot checks by the government. 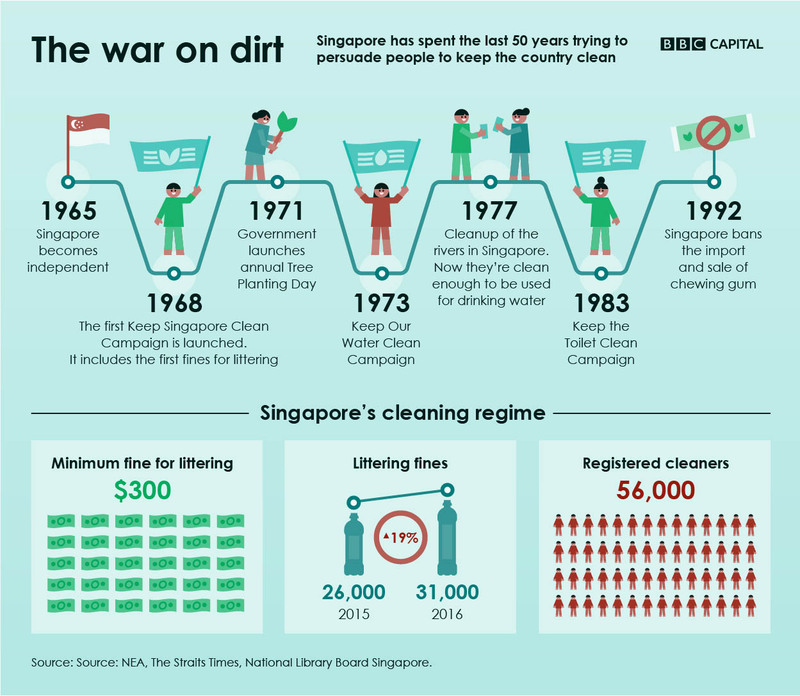 There were also competitions which highlighted both the cleanest and the dirtiest offices, shops, factories, government buildings, schools and public vehicles. On all of these counts, Singapore has done well. Life expectancy has grown from 66 to 83 (which is third best globally). In 1967, tourist arrivals were a little over 200,000compared to a just shy of 10 million for the first three quarters of 2018. Inward foreign direct investment ballooned from US$93m in 1970 to US$39bn in 2010. It’s now the fifth largest recipient of foreign direct investment, receiving $66bn in 2017. Perhaps it shouldn’t seem so unusual. It’s true that the West certainly differs when it comes to civil and political rights, and penalties here can be extremely tough, including the death penalty for drug offences. But Singapore is hardly the only jurisdiction to show enthusiasm for fines to discourage petty offences. New South Wales in Australia collected over $172m(US$121m) in parking fines in the last financial year, while councils in the UK collected £820m in a similar period. (Parking is actually a far smaller administrative challenge in Singapore because of deliberate policies to reduce car ownership rates). “The government cleans the apartment [building], right up to your corridor, typically twice a day. When you have a very efficient cleaning service, and your neighbour messes up the place, you don’t blame the neighbour, you blame the cleaner for not picking it up,” he says.